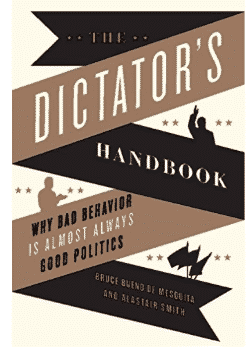 I’m currently reading The Dictator’s Handbook, which is a fantastic book about a completely different way to look at government. No, it’s not a book about bashing Trump because he’s a dictator and blah blah blah. That would be boring, and the book was written in 2012 anyway, i.e. long before Trump was a politics thing. What’s interesting about the book is that it describes an entirely different dimension to government. It’s like everything you’ve ever heard was in two dimensions, and the book gives you a z-axis. The short version is that terms like autocracy, dictatorship, monarchy, etc. are somewhat academic and unuseful terms when it comes to describing how a government works. The author instead breaks things down in a singular, fundamental way. Gaining and maintaining power. It’s quite Machiavellian, except far more formalized into a simple and transparent model rather than a collection of aphorisms. The central concept is that someone who seizes power must surround themselves with loyal people who have reasons to stay loyal and who can be trusted not to desert or betray them. As for the Trump situation, it instantly illuminated his cabinet picks. Trump isn’t hiring experts. He’s hiring loyalists. He’s putting people into place who he can trust. People who had his back when things got nasty. And people he can control and manipulate. He also broadcasts a powerful signal of fear to anyone who betrays him. He publicly states that he makes lists of those who oppose him, so that he may repay them back in the future. Romney just tasted that firsthand. It’s extremely Castro-like. Or any other powerful leader. Castro lasted 50 years in power, and virtually everyone wanted him dead. He’d regularly prune his inner circle through exile (Che Guevara) or execution (hundreds or thousands of previous loyalists). The book gives example after example, and provides tons of detail about the tactics and strategy of maintaining power by ensuring that you have loyalists around you who aren’t too smart or too ambitious. Suddenly Gulianni looks like the miracle appointment. Fallen from grace. Not attractive. Not a challenge to Trump in any way. And so far extremely loyal. Trump, once again, isn’t failing at the game—he’s playing a completely different sport, right in front of us, and he’s winning. And all we’re doing is jabbering on about how he’s making this mistake or that one. He’s not building a team of experts to run the country, because he’s going to run it himself. They’re there to defend him and keep him in power, as loyal servants. Nothing more, nothing less. It’s all him. It always has been. They’re just there for decoration and to tell him how cool he looks while he knocks heads together. We’re basically all being outplayed…again. This doesn’t mean he can’t or won’t self-destruct due to bad moves in other areas, but hopefully at some point we’ll learn to stop underestimating his ability to read and manipulate people. He’s really, really good at it. I strongly recommend the book, which you can get here. Thanks to Steve Crapo for the recommendation.